In early 2016 Jim became obsessed with the idea of constructing a street organ. In February 2016 plans for a Senior 20 from John Smith in Englandwere ordered. Construction of “Misty” began in March 2016 and finished (though it will never be ‘finished’) in August 2016. Since completing the organ Jim has given private performances in friend’s homes, has performed publicly with it on the San Diego waterfront, in Balboa Park, at the Antique Gas and Steam Engine Museum in Vista, CA, at the Kobey swap meet, the Little Italy Farmers Market, and at Belmont Park. 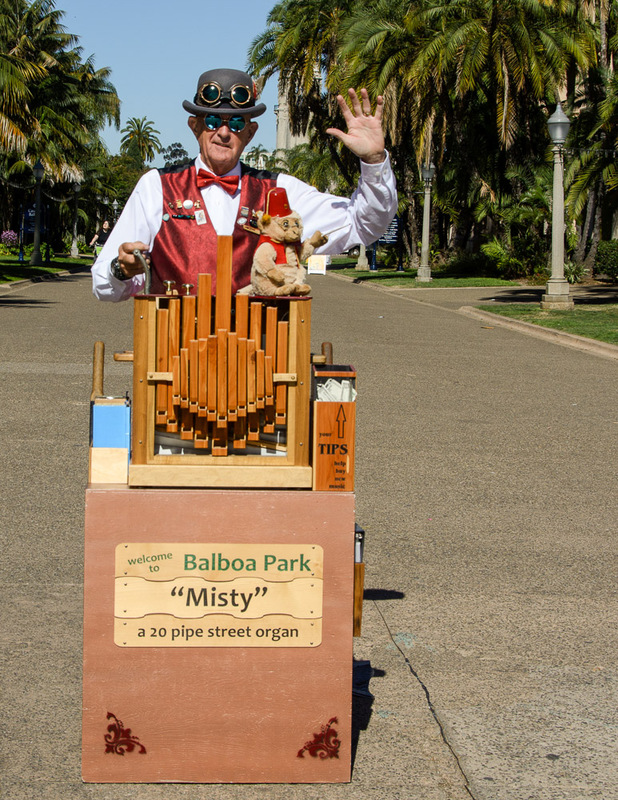 “Misty”, Jim’s first street organ, was constructed loosely following John Smith’s plans. Jim could not have constructed this first organ without John’s plans and the accompanying video. There is a lot of John Smith DNA in “Misty”. “Misty” is an actual acoustic organ. Cranking the handle at the back of the organ drives bellows which pump air into the reservoir. The air in the reservoir escapes into the organ pipes through holes in the music rolls. Each roll holds approximately 7 minutes of music. Jim has started his second street organ. Building to his own plans this time Jim likes to think of it as ‘there is more James Coffee Studios DNA in this second organ…and less John Smith DNA’. As time flows and as Jim continues to construct street organs the DNA ratio will continue to become James Coffee Studios stronger. Jim does have ultimate respect for John Smith and could not (would not) have created the first street organ without his plans. On the other hand he is an artist with a technical background so is comfortable moving forward with plans that he is creating for himself. Jim has had many people ask where he’ll be performing next. Finally… a reasonable use for Twitter. Just follow @jwcoffee. Jim posts most appearances there.. Here are two videos that have been posted to YouTube. Plans from John Smith. Invaluable. The Busker Organ Music website. Lot’s of resource. The Busker Organ Forum. If you are considering building an organ take the time to read all of the posts here. Ronald Walters YouTube videos . Not only can you watch how he constructs different organ components…you also see how his shop is set up and how he works. An excellent resource. If you are wanting a fun overview of street organs visit YouTube. Lots of street organs there.